We are one of the coveted manufacturers and suppliers of a wide and exclusive range of PVC Moulds. This whole range has been designed and developed with the assistance of cutting-edge technology using quality approved raw materials. Acknowledged for its numerous variegated features of excellent finish, less maintenance, heat resistance and longer service life, this range can be availed from us at the most comprehensive and market leading price range. In this range we offer Designer PVC Moulds. 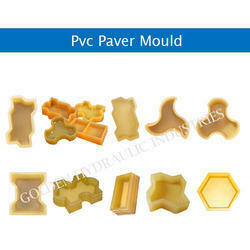 We are an unparalleled name engaged in offering premium quality PVC Paver Mould. 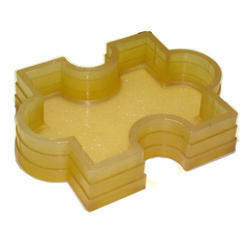 This mould is broadly used for making PVC block in various designs. The provided mould is manufactured as per the set industry standards and norms at our well-equipped manufacturing unit under the guidance of diligent engineers using the best quality raw material and pioneered technology. In order to ensure timely and flawless supply from our end, this mould is duly inspected against various quality parameters. We have gained expertise in delivering our patrons a remarkable range of Rubberized PVC Moulds For Paver Blocks - Zig Zag. All our products are developed by a team of hardworking professionals, following industry set norms and guidelines. The products we offer are widely used by various paver block manufacturing organizations to develop their range. Customers can avail these moulds from us for developing blocks of varied textures like ant, sand, bubbles, cloth and step. 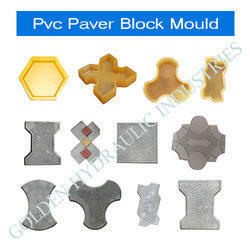 We are offering high quality Silicon Paver Moulds that are design in accordance with industry norms. With our rich industry experience in this domain, we are engaged in offering our clients a vast assortment of Paver Block mould. This mould is processed by making use of superior quality basic material in adherence to set industry parameters. The offered mould is available in various specifications as per the requirement of the clients. Apart from this, this mould is available at reasonable rates for our valuable clients.